I have a passion for children's books. There, I've confessed. The primary reason we have so many, aside from homeschooling, is that I love them. It's a bonus if the kids like them, too. I've been reading two books to Isaac lately that I wanted to share. 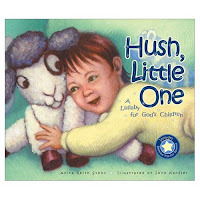 The first one is called Hush, Little One. Grammy and Papa gave Abbie her first copy when she was a toddler, and we went through two of them. The girls and I were even in a magazine add for Concordia Press after I sent them an email telling them how much we enjoyed the book. It presents the Gospel to children in such a sweet, gentle way, and you can sing the rhyme to the tune of "Hush, little baby, don't say a word, Mama's gonna buy you a mockingbird." Remember that song? Of course, you can read it, too, if you don't like to sing. Sometimes the girls would ask me to sing it, and sometimes they wanted me to "talk it." Emma used to say, "Emma's prayers by Jesus are heard!" It just melted my heart. I will tell you that I prefer the hardcover version, published in 2002. That's the one Abbie had. I found the board book for Isaac at Lifeway, and while I love being able to share the book with him in a format that he's less likely to change the story, the rhyme has been revised somewhat and I don't like it as well. I'm sure it's primarily because I expect the first version, but I do prefer the way the first version refers to Jesus rather than Christ as they do in the board book; it seems more personal to me. I think it was rewritten to fit better with the rhythm of the song, as I look it over, but I still prefer the original. This little book shows lots of neat things. It has opposites, colors, shapes, and familiar activities. Isaac's favorite is the "slide sheep." He always says "Whee!" and traces the path of the slide with his finger. He likes "sheepies" right now, anyway, so I make sure we take this book when we go out and always have it ready at bedime. Last, but not least, I must tell you about one of my all-time favorites. I found this wonderful little book in Borders in Ann Arbor (the first Borders, ever, by the way) and bought it for my niece when she was little - she's now a sophomore in high school. I try to give it to everyone I know when they have children. I have read it more times than I can count, and I still love it! It's called Sheep in a Jeep by Nancy Shaw. It is so funny, and so fun to read, if you haven't read it yet, you should at least get it from the library. There you have them - Book recommendations by Beth. I just thought of some more, but I'll save those for another day. I love Sheep in a Jeep! Before I was a mommy, I was a nanny. It was one of my wee charge's favorites. :) Thanks for sharing these...I'll have to check out the other two.